But while critics have accused Mozgovoi of facilitating mob rule, communist and Marxist commentators have cited his outspoken opposition to the corrupt, oligarchic government that has plagued Ukraine as proof that he is the best hope to turn the pro-Russian rebellion into a social revolution. Although the armed seizure of buildings in eastern Ukraine in April was accompanied by frequent calls for a social welfare state, communist and other left-wing activists have been marginalized by pro-Russian activists who are more nationalist in their rhetoric. The Communist Party wasn't allowed to run in last month's rebel parliamentary elections and in the end was given a meager 3 seats out of 100 by the ruling coalition, its leader recently told The Nation. Many left-wing activists have said the uprising has turned toward Russian chauvinism rather than social reform. For his part, Mozgovoi said he does not believe in ideologies but rather “popular democracy” and argued that the recent judicial spectacle had been misunderstood. “To create the mechanisms for a people's government, we need to create precedents like we're doing with the people's court,” he told The Nation. But the jury is still out on the leader: Is he a socially-minded revolutionary propagating a radical form of direct democracy to eradicate years of corrupt government? Or a populist warlord conducting reckless justice and ruling his fiefdom with an iron hand? A descendant of the Don Cossack warriors who lived in the borderlands of the Russian empire, Mozgovoi was born in the Luhansk region, studied music and sang in a choir, served seven years in the Ukrainian army and worked in the construction industry in St. Petersburg. 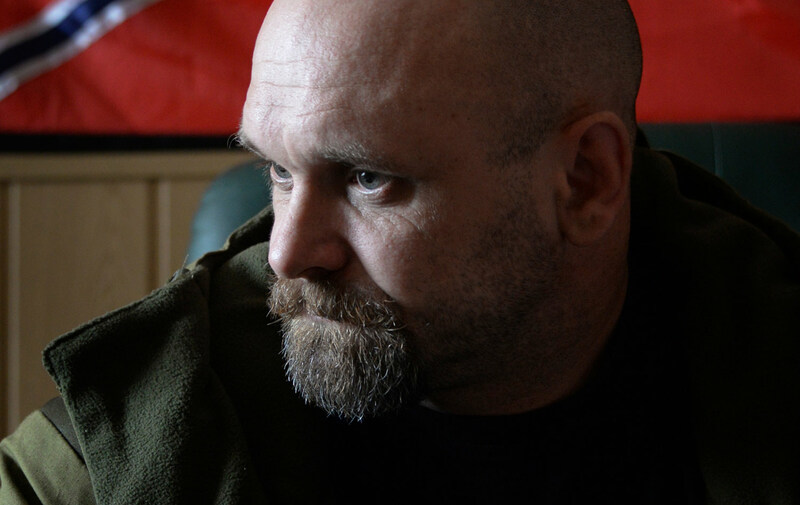 Returning to Luhansk in February as protests for European integration raged in Kiev, Mozgovoi joined other pro-Russian activists in holding rallies and camping out in the city center, where he first began putting together the group that would become his military unit, the Ghost Brigade. The unit has now grown to almost 3,000 men, he said. It is arguably one of the most potent fighting forces in separatist-held territory, which has made Mozgovoi a political force to contend with in the Luhansk People's Republic, where he has occasionally clashed with other separatist leaders. Having established a base of operations in Alchevsk (pre-war population: 111,360), he operates largely independently of the rebel leadership in the regional capital, which doesn't provide him with supplies or financing, he said. Mozgovoi characterizes his war as one against oligarchy and corruption. He sees both in the new Kiev government, which he derides as a pawn of US foreign policy. His anti-oligarchic stance—and an openness to dialogue—has allowed Mozgovoi to take on a new possible role, that of the peacemaker, in three Skype sessions with volunteer battalion commanders fighting in Kiev's “anti-terrorist operation” against the pro-Russian rebels. Mozgovoi and his battlefield opponents seemed to agree upon the essential problems facing Ukraine—poverty, corruption and oligarchy—even if they differed drastically on the solutions. During the first conversation, Mozgovoi offered that the conflict could be solved if the volunteer fighters on both sides would join together to “clean out the parliament and the government” in Kiev, a suggestion that seemed to resonate with the pro-Ukrainians present, several of whom spoke out against the government of oligarch president Petro Poroshenko. But Mozgovoi's political platform remains fluid, ill-defined and sometimes contradictory. Although he is ostensibly fighting for the creation of a pro-Russian “Novorossiya” state over a wide swath of southeastern Ukraine—he at one point suggested resurrecting the Russian empire—he said the regimes of both Russia and Ukraine run counter to true government by the people. He admitted he is worried that the rebels in their alliance with Russia are simply trading one oligarchy for another. The commander's support for radical popular democracy has a darker side. By law, Ukraine doesn't allow the death penalty such as that handed down by the people's court, but Mozgovoi is by all accounts the ultimate authority in Alchevsk right now. As The Nation arrived at his headquarters in a decrepit former printing press for the interview, a group of haggard-looking men swept the street outside, part of the “work therapy” Mozgovoi has instituted for minor crimes like violating the curfew or drunk and disorderly conduct. Sitting in an office decorated with old weapons like a saber and a WWII-era submachine gun, the commander said his order to arrest woman in bars was “absurd” and that the man sentenced to death would remain alive for now. “We didn't conduct that court to shoot someone, but rather so people could feel how it is to make a decision themselves,” Mozgovoi said. Both of the sentenced rapists told The Nation—in the presence of armed guards—that they were being held in decent conditions, although one had a black eye, which he said he got when he slipped on a small set of nearby steps. Oleg Izmailov, a Donetsk-based journalist and political analyst, called Mozgovoi's people's court a “medieval” practice, but said it was also reminiscent of the tradition of “people's gatherings” common in Russian villages and Cossack communities. He added that “social revolution is closer to him than the idea of national revolution,” unlike with many rebel commanders, and admitted that Mozgovoi's ideas have a popular appeal. But relatives of the two sentenced rapists questioned the commander's methods. According to Russian Marxist Kagarlitsky, although Mozgovoi lacks an intelligible political program, such populist military leaders are typical in times of unrest. Nonetheless, he remains the “best show in town from a left of point of view,” Kagarlitsky said. Sociologist Volodymyr Ishchenko, a pro-Ukrainian leftist commentator and a member of the editorial board of Commons: Journal for Social Criticism, said Mozgovoi has “ideas about anti-oligarchic egalitarian democracy.” But the commander also has “conservative, sexist ideas,” he said, calling into doubt Mozgovoi's ability to influence the separatist movement to focus more on left-leaning social reforms.